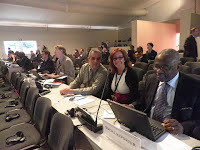 The first day of 34th session of IFAD’s Governing Council was both intense and exciting! IFAD was honoured to have a number of distinguished keynote speakers and the IFAD social reporting team had the privilege of using social media to bring the words of our esteemed guests to millions of people. A silent revolution has happened at IFAD. 18 months ago, who would have imagined that one day social reporting would be mainstreamed in IFAD activities and processes? Well, now it is. 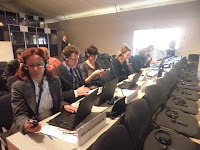 The very fact that social reporters had seats assigned to them in the plenary hall is a testimony of this fact! Thanks Andreina for reserving a strategic corner for us and given the success we are sure next year we'll have a bigger one! Today, thanks to social media and social reporting we were able to share the moving words pronounced by Her Royal Highness Princess Haya Al Hussein United Nations Messenger of Peace; share the wise words of Mr Kofi Annan, Chairman of the Alliance and IFAD President’s call for action. The panel discussion on “Feeding future generations – Young rural people today, prosperous farmers tomorrow” that took place in the afternoon was also an intense experience. The challenging questions posed by the moderator, Tumi Makgabo, engaged the audience in the room and on social media for over 2 hours. We had an overwhelming response on Twitter and Facebook with tweets flying in from all over the world and questions being posed on our Facebook page. The interventions of the audience in the room - the panellists, IFAD governors and young farmers and entrepreneurs - are still vibrating on the internet – better known as the “cloud”. With his passionate interventions, Carlo Petrini, definitively did an excellent job in engaging and more importantly challenging the ministers and governors present in the room. “What are the reasons, and what are the solutions for the relative neglect of young people – men and women – in national agricultural programmes, given their critical role in feeding the world tomorrow? Why do young people not want to get involved in agriculture? At the end of the panel, there was a general consensus on the need to listen much more to young people and involve them in paving the way towards a better world. Petrini was kind enough to grant the IFAD social reporting team an interview. Make sure you tune in and listen to his call for action! Now we’re getting ready for the second day which will focus on discussing challenges and opportunities of young people in Asia, Africa, Latin America and Near East and North Africa. I have just walked in the plenary hall and was pleasantly surprised to see the President sitting next to the social reporters. We could not miss the photo opportunity and also to have him on the team just for few minutes.